I wasn't sure how Lara was going to respond to the Leapster GS Explorer because it is unlike anything she has seen me or Mr. B. use but I needn't have been worried, she took to it instantly! The LeapsterGS is the next generation Leapster Explorer from Leapfrog and it is suitable from around 3 to 9 years old (although actually I think you could get good use of it from slightly younger than 3 and slightly older than 9). 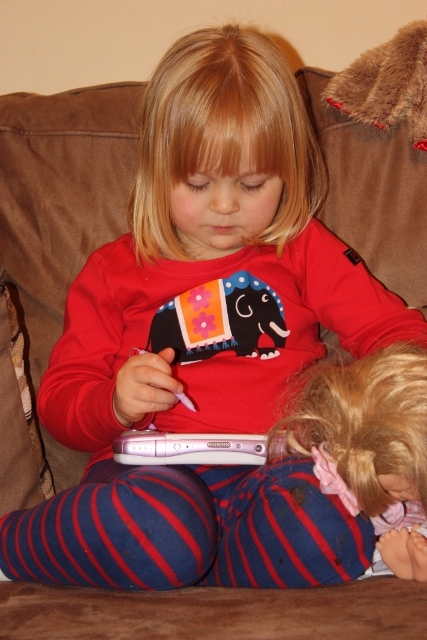 The LeapsterGS is a hand-held games and learning system. It has a small screen of very approximately 6cm by 8cm but when I compare the screen size to the learning tablets out there, in fact this screen isn't much smaller! The console has buttons for movement and actions on the front and on the top so that your child can use whichever feels most comfortable to them. The screen on the LeapsterGS is a touch screen and it comes with a stylus which, quite sensibly, is attached on a string so it should be harder to lose (I'm not going to rule out a 3 year old just pulling the whole thing out!). It takes 4 AA batteries which means that actually it is relatively weighty for such a small piece of kit but thankfully I have found the battery life to be pretty damn good. You can also run it from the mains if you have a suitable adapter, or from USB (I haven't actually tried this). 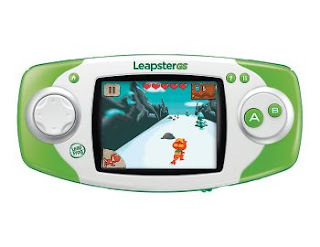 The USB port is really intended for you to connect the Leapster GS Explorer to your computer so that you can download and upload images and movies as well as games and apps that you can purchase through the Leapfrog Connect software. 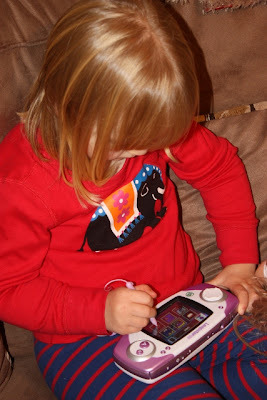 I was REALLY pleased at how intuitive and easy it was to access lara's photos that she had taken with her Leapster GS - compared to the VTech equivalent software, I find this a lot more usable. I also really like the fact that I can log into my Leapfrog account and see what games and apps Lara has been playing, or what stories she has been reading and see how this is helping her with her basic preschool learning skills. The Leapster GS allowed us to download two free learning games when we first got it - they were, as I had suspected, of dubious quality but they were free, and in fact Lara seems to very much enjoy one of the maths apps we downloaded. I also invested in a download card (you can get a £15 card for less than a tenner on amazon!) and bought Lara three branded downloads - A Finding Nemo story book, Umi Zoomi maths and shapes game and a creativity app which allows her to draw and colour pictures then save them and send them via email or facebook when we connect her console to the computer. You can store upto 2GB of data and apps on the console and you can also buy additional games cartridges. I'm happy with the quality of the paid-for downloads - most of them feature well-known TV or movie characters or the Leapfrog characters. I would say though that at £5 upwards, you don't get a lot for your money compared to iTunes apps. Lara has gained a lot of independence since she first started playing on her LeapsterGS. She will quite happily sit with a pair of headphones plugged in and challenge herself to complete a game. She also quite likes taking silly photos of us! The LeapsterGS has nearly all of the features that the Leappad has - motion sensitive games, a built in camera and microphone and access to a HUUUUUuuuge array of downloadable apps. It is slightly more compact than the leappad so I think it is ideal for taking with you when travelling. We are planning on taking ours on holiday with us as it barely takes up any space. * The battery covers are bliming hard to remove. It took two grown ups quite a lot of effort to manage to remove them. I suppose that's probably a good thing though as you don't want your children to be able to easily access them. * The LeapsterGS Explorer didn't come with many apps installed on it - I particularly expected some sort of creativity/colouring/drawing app to come as standard, or a short story book. It does come with a 'pet' app which allows your child to create virtual pets and earn toys and accessories for it but this is a little beyond Lara right now.